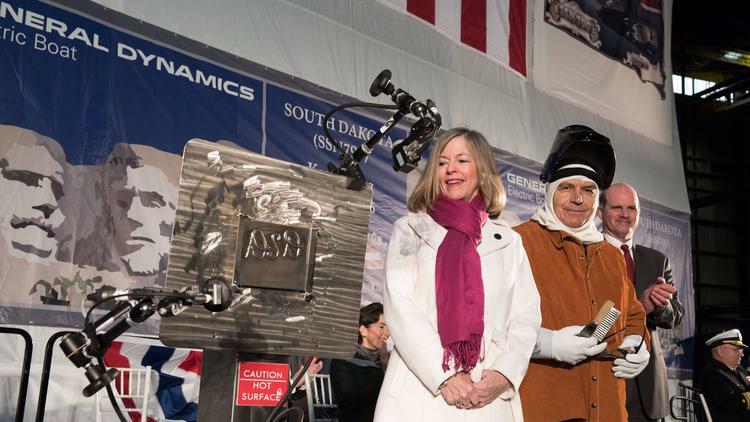 The USS South Dakota, the ninth Virginia-class submarine built by General Dynamics Electric Boat for the U.S. Navy, was unveiled and christened in Groton on Saturday. The nuclear attack submarine, which will be home to a crew of about 130 people, was built in the early stages of a massive ramping-up for Electric Boat, which operates a shipyard in Groton and a design and engineering facility in New London. U.S. Rep. Joe Courtney, one of several Connecticut officials who participated in Saturday’s christening, called it a “renaissance area of growth and innovation” for the town, which is sometimes referred to as the Submarine Capital of the World. “As those of us in Connecticut know, this shipyard looks dramatically different today than nine years ago, when South Dakota was first authorized by Congress,” he said, At that time, Electric Boat’s facilities in Groton and Quonset Point, R.I., were producing just one submarine a year, he said. Since then, Electric Boat’s workforce has grown from fewer than 10,000 people to 16,000 — about 2,000 of whom have been hired since Jan. 1. The company also is planning to upgrade and modernize its Groton and Rhode Island shipyards and hire another 2,000 people in the coming years to help develop the next generation of nuclear submarines, Electric Boat President Jeff Geiger said Saturday. “All I can say to [sub Cmdr. Ron Withrow] and the crew, ‘You brought us good fortune over the last nine years and hopefully it will stay with us long after you go to sea,’ ” Courtney said. Six more Virginia-class ships are under construction by Electric Boat as part of a contract for 28 ships, shared with construction partner Newport News Shipbuilding. The South Dakota was the 17th Virginia-class ship to be completed. Electric Boat is also beginning to prepare for its next Navy contract, a $5.1 billion award to design and build the lead submarine in the new Columbia class, a ship that will be nearly three times bigger than the South Dakota, which can displace about 7,700 tons of water. Once commissioned, the Columbia fleet will carry about 70 percent of the nation’s nuclear arsenal, according to Electric Boat. To prepare for the future workload, Electric Boat also revitalized its apprenticeship programs and doubled its investment in employee training and development, Geiger said. “We are excited by this opportunity and committed to meeting the expectations of the Navy,” he said. U.S. Sen. Richard Blumenthal said he was grateful for the chance to celebrate the current workforce. He called the completion of South Dakota, which took four years to build, an example of Electric Boat’s hard work, excellence and integrity. This entry was posted in Christenings and tagged christenigs, uss south dakota. Bookmark the permalink.